Saturn will shine near the first quarter moon on Aug. 22, 2015. 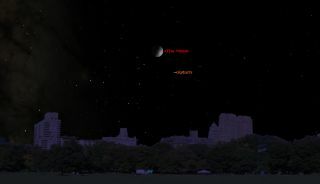 The ringed planet will be visible as a bright dot to the lower right of the moon in the southwestern night sky. If the weather is clear in your area on tonight (Aug. 22), you'll have an opportunity to see what probably are for most people, the two most popular objects to look at through a telescope: Saturn and the moon. About an hour after sunset, roughly one-quarter of the way up in the south-southwest sky, you'll see the first quarter moon. Actually, the moment of first quarter phase occurred earlier in the day – 2:31 p.m. Eastern Time; 11:31 a.m. Pacific Time. So what you’ll be seeing is a waxing gibbous moon, a little more than half illuminated. And if you look to the lower right of the moon, you’ll see a bright "star" shining with a steady, yellow-white glow. Except that's not a star, but the ringed wonder of the solar system, the planet Saturn. Both the moon and Saturn will be available for viewing until they set shortly after 11:30 p.m. local daylight time. Without question Saturn is the showpiece of the night sky. Its famous rings can be glimpsed with a magnification of 30-power and currently they are tilted more than 24 degrees to our line of sight. The rings of Saturn consist of billions of particles are approximately fist-sized and made of – or covered by water ice. The ancients regarded Saturn as the "highest" planet, occupying the outermost or highest sphere before that of the fixed stars. When Galileo’s crude, imperfect "optick tube" revealed Saturn as having an odd pair of appendages or companion bodies on either side, he announced this discovery in 1610 with an anagram written in Latin. The jumbled letters could be transposed to read: Altissimum planetam tergeminum observavi ("I have observed the highest planet to be triple.") It wasn't until a half century later that telescope lenses improved to the point where the ringlike nature of these "appendages" became apparent. Currently, Saturn is in the constellation of Libra, the Scales. Since Saturn requires 29.5 years to orbit the Sun, its progress through the 12 zodiacal constellations is quite slow, averaging roughly 2.5 years per constellation. The last time this planet was located in Libra was in 1983.